Republicans and Mitt Romney have been behind the entire month of September. With their convention providing little lift and the Democrats rolling out of their post-Labor Day event with a three-point bounce, the remaining month of campaigning has not changed the spread. 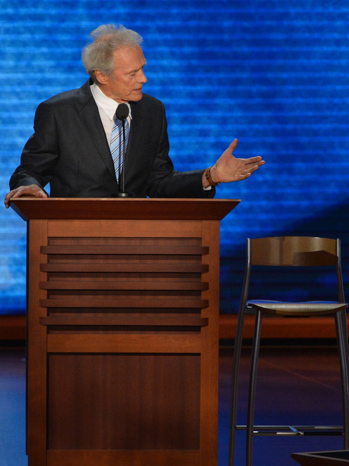 Romney will go into the October 3rd debate substantially behind. Although the underdog can garner sympathy, there are high expectations for the challenger who needs to change a campaign’s direction. A too quick reaction to the Libyan attack, causing consternation among the foreign policy establishment, including some Republicans. Subsequent events are justifying much of his basic criticism of Obama’s policy and especially his watchfulness in Libya. “Off the record” fundraising comments on the “47 percent” of Americans dependent on government that are easy to characterize as harsh and divisive. It also started a long media cycle as to the accuracy and implications of the position. But possibly the biggest pre-debate challenge is the tendency of hundreds of political analysts and news and commentary outlets to declare the race unwinnable and go into early post-mortems on what the campaign and candidate did wrong. 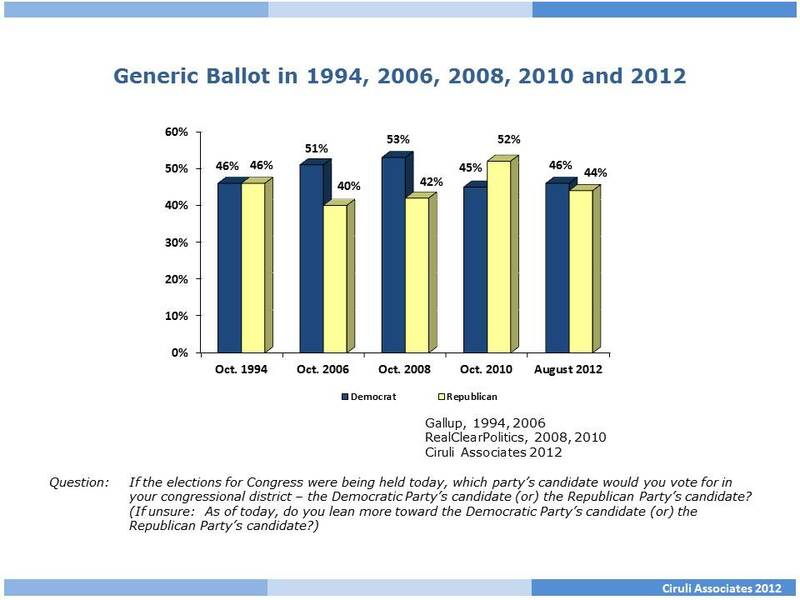 One of the most watched polling numbers is the generic ballot test of congressional races. It now appears to be leaning Democratic (2 points on Sept. 25), meaning that Colorado’s two Democratic congressional challengers – Joe Miklosi in the 6th CD and Sal Pace in the 3rd CD – could get a little help from an electorate starting to lean Democratic. Most of this year, the ballot test has been dead even or closely matched with a small Republican or Democratic advantage. This new shift is being generally interpreted as a product of the Democratic surge in the presidential polls since the convention, which has been accompanied by an increase in Democratic enthusiasm for the election and improvement in the party’s image with the electorate at large. The Democrats need to pick up 25 seats, not a high number. Republicans were up 7 points in 2010 when they won 65 seats and Democrats recaptured the House in 2006 with a 9-point advantage, winning 30 seats. Typically, Democrats need a few more points than Republicans on the generic test to make up for low turnout, but in this presidential election, that may be less a factor. Barack Obama holds a four-point advantage as of Tuesday, September 25, after two weeks of hard campaigning since the party conventions. Given Mitt Romney’s September controversies, the fact the race is still reasonably close is a sign his base is staying with him and a polarized electorate – but, it’s a very big hole to get out of in a very short time. Presidential campaigns generally have difficulty shifting the direction six weeks out. And, early voting begins this week in a few states and in many others within two weeks. Fred Barnes, in a new article in the Weekly Standard, argues that Mitt Romney should win Colorado given its current election voter registration leans Republican and the strong 2010 Republican performance. In fact, he argues Colorado may be essential if eastern states, like Ohio or Virginia, falter (see article). 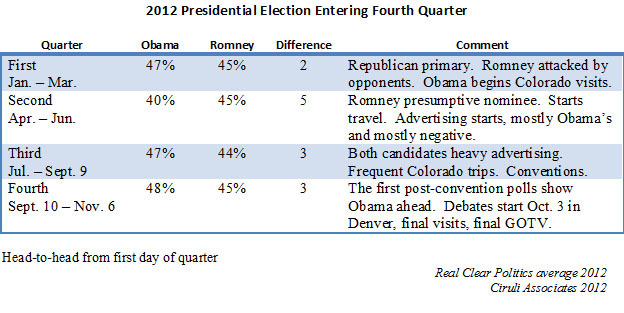 Barack Obama has run only slightly ahead in Colorado all year. And, his frequent visits and four-to-one advertising expenditures over Romney reinforces the view the state will be competitive. 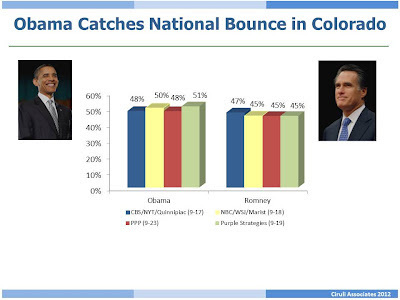 But, in the last couple of days, Colorado appears to have joined the rest of the country in a surge toward Obama. 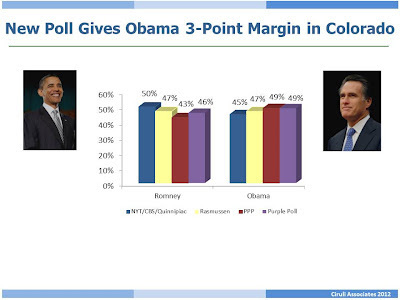 On Thursday, September 18, NBC/WSJ/Marist reported a five point Obama lead. 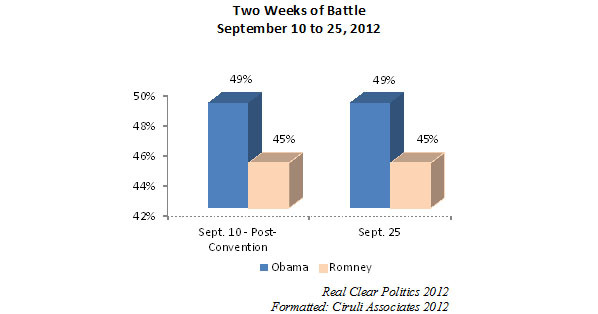 That reflected a major jump for Obama from three previous polls, which showed the race as break even. 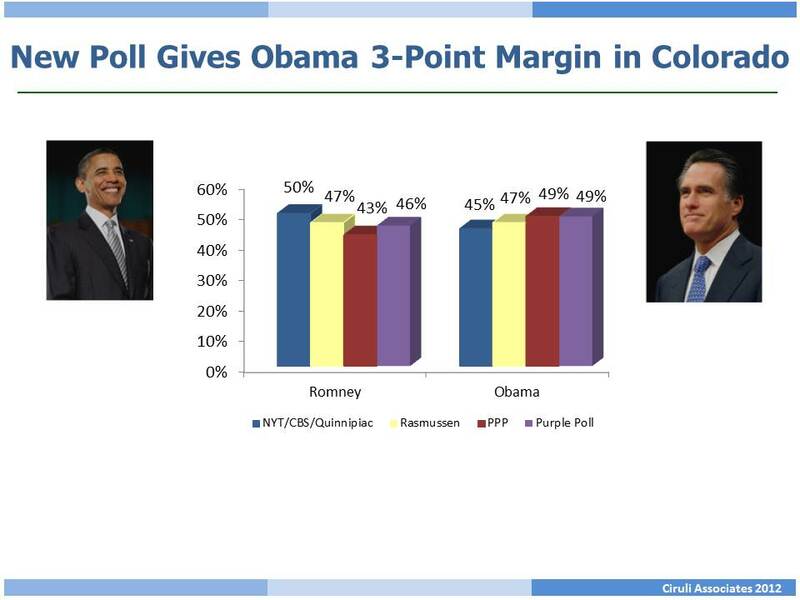 Two new automated polls from Purple Strategies on September 19 (Obama up 3 points) and Public Policy Polling on September 23 (Obama up 6 points) appear to confirm movement toward Obama. Coloradans, historically, have been more inclined to support third-party candidates than many other states. Both Ross Perot in 1992 and Ralph Nader in 2000 received high voter percentages in Colorado than their national average. So, could former New Mexico Governor Gary Johnson be a spoiler in the 2012 closely contested presidential election? It is possible, but only if the race is razor-close or if Johnson receives considerably more attention than presently. Recent polls show candidates offered as “other candidates” in presidential choice questions are getting one or two percent. Gary Johnson, when specifically offered as an alternative in Colorado, has received from three to five percent in recent automated polls. Unfortunately for Johnson, he will only be listed with a dozen or more alternative party candidates in Colorado. He has generated little publicity or interest and has no campaign. When his name is mentioned in poll questions, he tends to draw from younger voters who are both Barack Obama and Mitt Romney supporters. So, unless the presidential race is down to a couple of thousand votes, Johnson is unlikely to affect it. 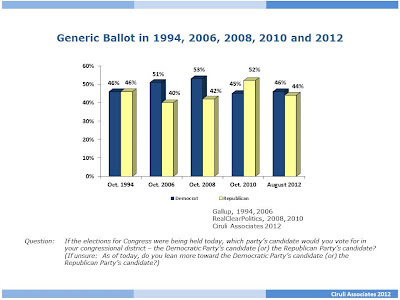 Recent national polls offer respondents a generic alternative category along with the major party candidates. “Other” has been receiving one percent of the vote (ABC News/Washington Post, Sept. 11, 2012). Gallup reports minuscule support for third-party candidates nationally when identified by name and party. Gary Johnson of the Libertarian Party received one percent. 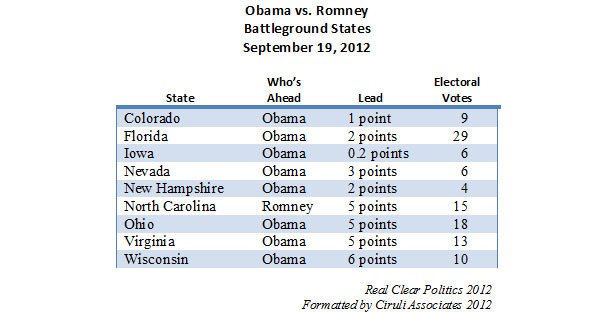 In 2011, the Obama campaign identified its battleground states and assumed that Mitt Romney was the most likely opponent. The ground machine was installed, the presidential visits began, and within weeks of Romney’s designation as the presumptive nominee, the air war was launched with massive attack advertising. The strategy appears to be working. Barack Obama is leading in 8 of the 9 toss-up identified states. He could be heading to a narrow national victory (3 percentage points today), but a substantial electoral vote sweep due to the strategy (332 to 206, or 23 percentage point spread). 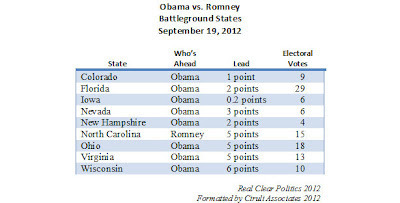 Out of nine states generally seen as the battlegrounds for the presidential election, using the Real Clear Politics averages, Romney is only ahead in one – North Carolina (5 points). Obama is ahead in the remaining eight states, with an average two-point lead. However, Iowa and several states with one-point differences are essentially toss-ups. And, in all nine states, local or national conditions could shift the momentum very quickly. In three other states with substantial campaigning, Obama leads in two in current polling (Michigan: Obama 6 points, Pennsylvania: Obama 8 points, Missouri: Romney 7 points). Looking at the electoral map, if Obama takes all the states Democrats regularly win (and current polls show substantial leads), he will have 237 electoral votes toward the needed 270. Romney will have 191 by that criterion. If Obama takes the nine toss-up states he currently leads, he would pick up 95 out of the 110 electoral votes in the toss-up list. Obama would win with 332 electoral votes – down from his 365 in 2008, but still a 33-vote cushion. This is why when the story of the 2012 election is told, and if Obama wins, his strategy of putting the bulk of his campaign in the battleground states and starting the visits and air war early may be seen as the key to his victory. Time is running out for presidential campaigns. 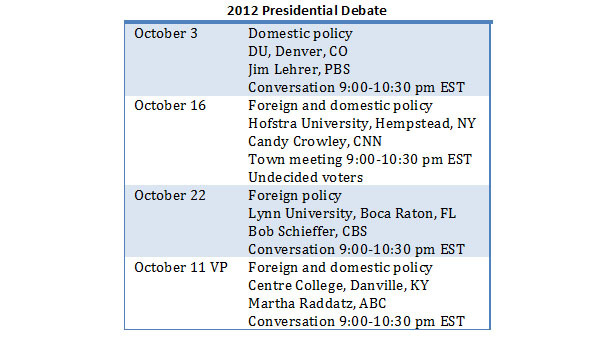 By the time Denver hosts the October 3rd presidential debate, Iowa will have been voting for nearly a week (Sept. 27). Critical Ohio begins the day before the debate (Oct. 2). Toss-up states Colorado and Florida will begin early voting on October 22 and 27, respectively. More than 70 percent of Colorado’s votes will likely be cast before Election Day (79% in 2008). All western states allow early voting and no-excuse absentee voting, except Oregon and Washington which have an “all mail” voting. As of mid-September, Barack Obama is holding onto a post-convention bounce of three points (Sept. 18) in the Real Clear Politics polling average. If the same patterns as the 2008 and 2004 elections apply, his lead today indicates a November re-election, but his vote spread is cut more than in half from his seven percent victory over John McCain in 2008. Obama is three points ahead of Mitt Romney today, and four years ago at the same mid-September point he was eight points ahead of John McCain. Four years ago this was the critical period for the McCain campaign as it was forced to deal with the financial meltdown – Lehman Brothers collapsed on September 15 – and the shaky media performance of Sarah Palin. In 2004, John Kerry was slightly behind after the conventions and lost a close race that finally hinged on Ohio and about a 100,000-vote margin for G.W. Bush. 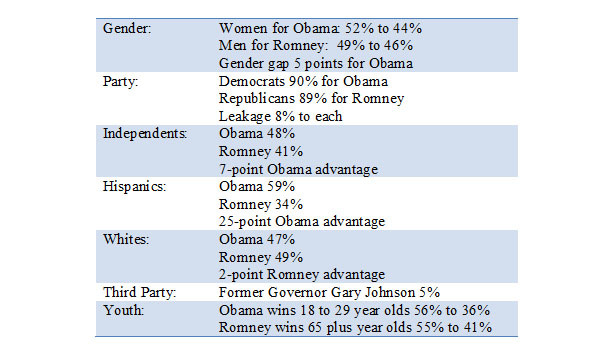 Every historical pattern is meant to be deviated from, and Romney may still alter the polling trend. But early voting starts in about two weeks in Iowa and shortly thereafter in a half dozen toss-up states. Both national and recent Colorado polls don’t provide much support for more gun regulations, but a majority of voters support specific proposals related to reducing access to certain types of weapons, armor and ammunition. The August New York Times/CBS/Quinnipiac poll reported only 38 percent of Colorado voters favored more strict laws. The presidential race in Colorado has been close the entire year, with a small margin of error-sized advantage for Barack Obama. The economy in Colorado has improved since January, but Obama’s margin seems impervious to the local change in conditions. Alana Semuels of the Los Angeles Times describes the apparent contradiction of an improved economy and a still struggling president. My observation was that national conditions tend to be more determinative in voters' presidential choice than local. New polls appear to show Barack Obama receiving a convention bounce of two to four points based on Bill Clinton’s nominating speech and due to a large audience for his acceptance speech. Mitt Romney pulled even as the Democratic convention began (although, there was a debate among analysts if the bounce was a convention effect or outside influence). But, Obama has been up a couple of points throughout the summer, and now appears to have reestablished that dominance. Unfortunately for Romney, neither the selection of Paul Ryan nor the Republican convention changed the game. In spite of the fact there are only a handful of undecided voters, Colorado can now expect a swarm of visits from the candidates and their surrogates and a major build-up for the October 3rd debate. If it’s still close on Oct. 3, the presidential debates will become the hyper events that frame the final month and push the handful of still undecided voters to their final decisions. Denver and DU will be the site of the first debate with its attendant media scrum. Domestic policy will be the topic and mostly retired Jim Lehrer of PBS, the moderator. Like conventions, debates have seldom decided elections, but in a close race, they can lend an edge. 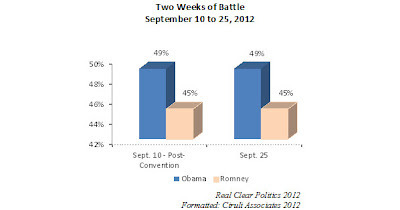 If Barack Obama’s post-convention bounce holds, Mitt Romney will be hoping for a breakthrough. We can expect a total war. Romney and Ryan are already practicing. Of course, there is always the possibility of a major stumble, but more commonly, debates just reinforce established impressions. With confidence in the public school system at an all-time low (see my blog of June 26, 2012), Americans now rate private, including independent and parochial, schools much higher at providing children a good education. Even parents of children in K-12 education, most of whom (83%) are in the public system, say private schools are of higher quality (see Gallup poll of August 29, 2012). Independent private schools and parochial and church-related schools receive the highest performance ratings from not only Americans overall, but parents of public school children, Republicans and even Democrats. Democrats were a little more supportive in their affection for the public system, which generally could garner barely a third of the public offering a positive rating for performance. Charter schools, a relatively new concept and not operating in every school district, receive support from 60 percent of the public and parents. Advocates of reform of the public school system are behind public opinion, which has already judged the public school system as inadequate and underperforming available alternatives. 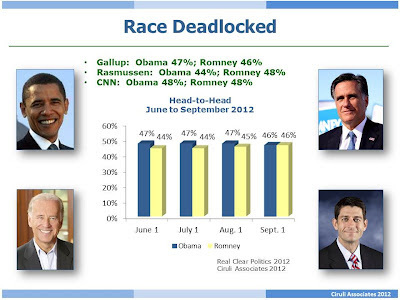 The latest automated PPP poll has Barack Obama ahead by three points as of September 2, or 49 percent to 46 percent. It continues the trend of the last month of Colorado polls. Obama has been ahead in all but two and one was a tie. All the previously reported statistics show themselves to be continuing in the latest poll. With the Democratic Convention over, the questions begin as to who will win and why. The following is a start in the conversation. If President Obama wins re-election, why? 1. For a variety of reasons, incumbent presidents have an advantage – universal name identification, and policy and public relations resources of the White House. And, most importantly, voter inertia; i.e., changing horses in middle of stream, etc. aphorisms that especially appeal to more conservative voters. 2. The economy is bad, but comparisons with the economy in previous presidential re-elections show conditions place Obama in a better position than Carter and Bush I, but behind Reagan, Clinton and Bush II; that is bad, but maybe not bad enough. Plus, Obama says, and the public agrees, that much of the problem was inherited. 3. The core Democratic constituencies have grown a bit to make up for some loss of enthusiasm. And, African-Americans, Hispanics, young voters and single women have been appealed to with interest group and identity politics. Polls show they are providing expected margins, especially in swing states. 4. One year ago, the Obama team realized they were going to lose if they didn’t shift the conversation from what Obama has accomplished to what the Republicans can’t and won’t let get done. Hence, the yearlong offensive on taxes and income inequality; i.e., the embattled middle class, “trickle-down economics,” etc. 5. Part of that reframing was the anticipation Romney would be the nominee and business acumen his major strength. His major weakness is his corporate wealth. The Obama campaign has portrayed him as an out-of-touch rich guy. 6. 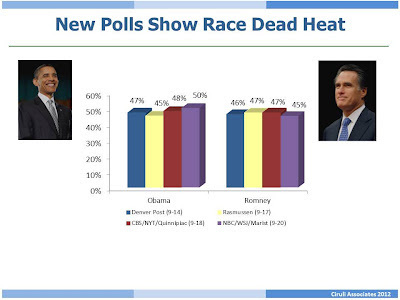 Obama wins both favorability and empathy polls over Mitt Romney by 20 or more points. It helps blunt Obama’s competence deficiency, especially on the economy. 7. Obama’s campaign advanced presidential political techniques in the 2008 race. They tuned them up again to make up for an enthusiasm gap and parity in fundraising (last time they outspent John McCain substantially). Barack Obama has nearly moved to Colorado college campuses in an effort to motivate the country’s younger voters. He’s winning them two-to-one, but they may not vote or may vote for alternatives. He drew a huge crowd at Fort Collins’ CSU campus during the Republican Convention and Sunday at Boulder, but he still faces a challenge from young voters who just joined the voter role and have mostly experienced the disappointment of a terrible job market and not the hope and change campaign of four years ago. Two recent polls affirm that Obama has the youth vote by two-to-one in Colorado. A September 3 automated PPP poll shows Obama beating Mitt Romney by 20 points among voters aged 18 to 29 years old (keep in mind the 18 to 21 year-old voters will be casting their first vote). The live interviews in the New York Times/CBS/Quinnipiac August poll, using a broader age category of 18 to 49 years old, showed an 11-point Obama advantage among the youngest category. In the PPP poll, young voters also were the most undecided. Note: For all of Obama’s effort with the young, he is losing seniors by about 15 points in Colorado, which is one reason the campaign is so interested in using Paul Ryan’s Medicare position as a wedge issue. National polls agree Obama has the youth vote. The national race for the White House deadlocked as of September 1 in the national polling average maintained by Real Clear Politics at Barack Obama 46 percent vs. Mitt Romney 46 percent. The race has been within three points all summer, with an Obama advantage. Romney was able to close the gap, but not much more with his convention. Obama now hopes to restore his two-point advantage as the final sprint begins. The weak Romney bounce was mostly a product of a non-charismatic candidate and only a handful of people still uncommitted and available to react. As the Democratic National Convention begins, the latest Gallup report reaffirms President Obama’s weakness on the economy, but shows his strength on terrorism and relative strength in foreign affairs. Unfortunately for Obama, the economy and deficit are top issues in the public’s minds as needing to be fixed whereas foreign affairs is back of the mind and only likely to break out in a crisis. The Paul Ryan pick should help the Republicans put spending, debt and the deficit front and center in the campaign. Obama only receives a net positive approval on foreign policy and terrorism, but has a 20 plus point net disapproval on jobs, the economy and the deficit. Immigration is not a positive for the President, with some liberals, Democrats and Hispanics wanting more pro-immigration policies and many others wanting less favorable and more punitive actions. But, in general, only 38 percent of public is satisfied with Obama on the issue. Obama’s current rating on the economy is lower than recent presidents running for a second term.